Several popular compact SUVs did poorly in a tough new crash test conducted by the Insurance Institute for Highway Safety. However, two, the new Subaru Forester and the Mitsubishi Outlander Sport, did well. The Hyundai (HYMTF) Tucson, Ford Escape, Kia Sportage, General Motors (GM)' Buick Encore and the Chrysler Group's Jeep Patriot earned "poor" marks in the new "small overlap" frontal crash test. In this test, the vehicle hits a barrier at 40 miles per hour with just one-quarter of its front bumper. The impact occurs on the left side, just in front of the driver's seat. This concentrates crash forces in a small area that's outside of the strong crash safety structures built into most new vehicles. About a quarter of the serious and fatal injuries in front crashes are caused by "small overlap" impacts similar to this, according to the Institute. These crashes can also cause severe foot and leg injuries as the car's front wheel is pushed back into the passenger compartment. Real small overlap crashes often happen when vehicles leave the road and hit trees or utility poles. The small overlap test is just one of several crash tests performed by the Institute. Most vehicles already do well in the other crash tests. 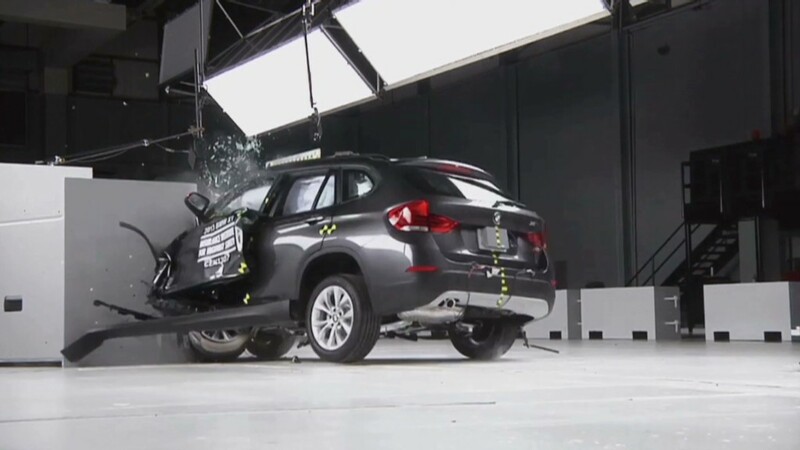 In defense of their vehicles' overall safety, Chrysler, General Motors (GM) and other manufacturers pointed out that their SUVs earned the Institute's Top Safety Pick award. "Ford takes seriously every industry development related to vehicle crash performance," Ford Motor Co. (F) said in a statement. "This is the first time IIHS has conducted this type of test on small SUVs. We are reviewing its findings in the context of our current design evaluations." Among the vehicles that performed well, besides being Top Safety Picks, the Subaru (FUJHF) Forester and Mitsubishi (MHVYF) Outlander Sport also earned the new Top Safety Pick "Plus" award. That award means they performed well in all tests, including the small overlap test. The Subaru and the Mitsubishi earned ratings of "good" and "acceptable," respectively, in the small overlap test. The BMW X1, Nissan (NSANF) Rogue, Mazda CX-5, Honda CR-V, Volkswagen (VLKAF) Tiguan and Jeep Wrangler earned the rating of "marginal" in the overall small overlap test. But when breaking down the test results down into more specific units, such as the crash protection provided by a vehicle's body and how well the crash test dummy's movements were controlled, the Institute pointed out the Rogue as an example of poor structural protection. After the crash test, the Rogue's door frame was almost touching the driver's seat, the Institute said. Nissan pointed out that the Rogue was, overall, one of the better performers in this new test. "Nissan will continue to review these and other results from the IIHS 'small overlap front test' as we seek opportunities for improvement," the carmaker said in a statement. Small overlap crashes are dangerous, in part, because the vehicle spins violently after impact, causing an occupant to move sideways, away from areas that are protected by airbags. Also, the vehicle itself can be contorted so that airbags end up not being in the proper locations to protect passengers. For instance, in the Jeep Patriot, the steering wheel moved up and to the right allowing the crash test dummy's head to slide off the airbag.